Your hosts Dan Brown and Jerry Jaffe welcome film writer and Star Trek historian Mark Clark to discuss the new seasons of both Star Trek Discovery and Seth Macfarlane’s The Orville. Along the way we welcome fellow comedian and Star Trek nerd Leslie Battle who tells us about meeting Nichelle Nichols. While comparing the strengths and weaknesses of both new shows, we also quiz Mark about classic Trek, such as the origin of Vulcan hand gesture, William Shatner’s acting, and why Gene Roddenberry kept having planets chock full of false gods! Laughing at and loving all things Star Trek—Live long and prosper! Your hosts Dan Brown and Jerry Jaffe have been wanting to do a Stan Lee In Memorial episode, and we recently has a chance to get together with our friend comic book historian Chris Lambert. We discuss Stan's origin story, as well as some of his most famous creations like Spider-man and Fantastic Four, his role in the rise of the Comic Book convention, his Marvel Movie cameos, and other interesting trivia. Dan tells of the time he saw Stan at a panel and Stan fielded the question "Who would win in a fight, Superman or Hulk?" Christ tell about getting Stan's autograph. We hope you enjoy or reminiscing and horseplay! Your co-hosts Jerry and Dan sit down with real live physicist AND local comedian Mitch Danger Powers (<<<note, no “---“ around Danger because that IS his actual middle name). Mitch studies and teaches physics at Kent State University (a Ohio University!). He joins us to talk about physics, science and movies. Jerry’s favorite part of the entire interview is when—sitting with a trained physicist—Dan Brown’s very first question is about Jurassic Park!! Oy Vey! Other movies and topics covered include Ant Man and the Wasp and the quantum realm, the physics of time travel and Dr. Who, Newtonian physics at play in the Fast and the Furious series, the age old question of whether or not Superman can actually catch a falling Lois Lane without killing her, Jurassic Park (again! ), tardigrades, and whether or not the physics on the Big Bang Theory is realistic. When you add science to a nerd podcast you get maximum excitation of molecules (aka an explosion of fun!). Action Comedy Nerd Show #14: 2018 Indiana Comicon - Voices of Comicon edition!!! 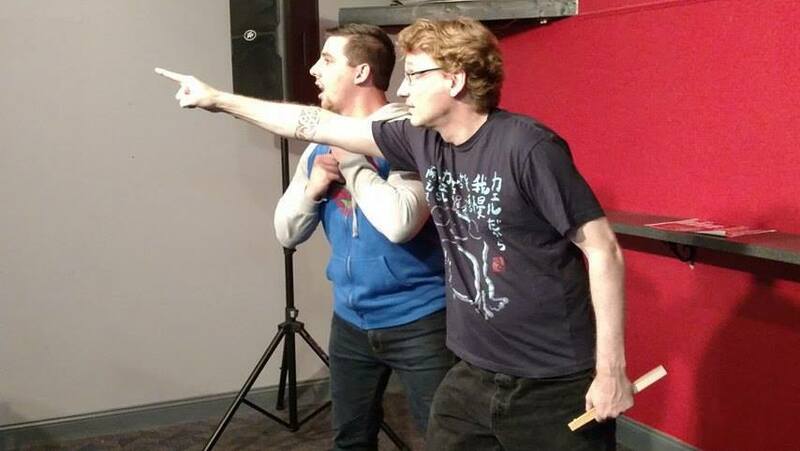 The Action Comedy Nerd Show had a great time at 2018 Indiana Comicon, with 2 shows w/ 200+ audiences. On the show were Dan Brown, Jesse Pimpinella, and Jerry C. Jaffe. This episode is themed "Voices of Comicon" (thanks DJ!!) and includes outtakes form our comedy shows, as well as interviews with comedian DJ Dangler, Jamie in charge of PR at Imaginarium (the parent company of Indiana Comicon), and a shout out form Red Power Ranger Steve Cardenas (Dan got al tingly when he got an autograph, a photo, and a shout out!!). Your humble co-hosts Dan & Jerry recently sat down with the author of the book Star Wars FAQ Mark Clark. Our conversation began in a galaxy far far away (Painesville, OH) and covered such topics as the original films, the rip offs, the parodies, while carefully avoiding any substantive talk about Jar Jar. This bonus episode is actually an outtake from episode 11 when Jerry, Dan, and our friend Chris McVetta did a summer movie wrap up roundtable. When Dan said he liked the Netflix Death Note movie, Jerry's head exploded and this giant digression took place. It was too long to keep in the original episode, but we have decided to share it as an outtake. In addition to Death Note, the Lego Batman movie comes up, as does Scooby Doo and the Dungeons and Dragons movie. Enjoy! Recently your humble co-host Dr. Jerry had a chance to meet legendary comic book author Mark Waid, so we sat down for a few and he told us about how he got into the business, his insights into Superman and Flash, DC versus Marvel, the cinematic universes, as well as the most expensive movie ticket he ever "bought." This special episode includes a cameo by co-host Dan Brown. Joined by our good friend pop culture critic Chris McVetta, your cohosts Dan Brown and Jerry Jaffe review movies and TV from the summer oF 2017. There is some adult language and LOTS of SPOILERS. Topics included are WONDER WOMAN, SPIDERMAN HOMECOMING, LEGO BATMAN and season 7 of GAME OF THRONES. Jerry, Dan, and the Action Comedy Nerd Show recently spent a weekend at Colossal Con (2017). Joined by our friend comedian Jesse Huber, we had a great show, and then hosted two panels. One of our panels was our patented street interviews, and boy what a doozey! Recorded live in front of a live audience, we had a chance to talk to many interesting people. The highlights include a quick interview with Flash Gordon aka Sam J. Jones and with adult film performers the Pixel Vixens. We also got some fun stories about bowling and tornados, and other con stories. As always, join the conversation with comments, and be sure to rate us on iTunes and Stitcher.